This item is a Future Release. A Future Release item has not yet been released onto the market or there is no firm delivery date by the manufacturer or publisher. 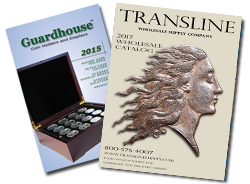 Except for the Red Book pre-sale, Transline does not cover shipping on Future Releases. If you pre-order less than $300 of this Future Release item now, your order will be released and shipped as soon as the item comes into stock, but you will pay actual shipping. To obtain free shipping on this Future Release, either re-order this item after it comes into stock or pre-order $300 or more of this particular item.